Three hallmarks of the pancreatic islets in early human type 1 diabetes are overexpression of HLA class I, endoplasmic reticulum (ER) stress and beta cell apoptosis. The mediators of these phenomena remain to be defined. The type I interferon IFNα is expressed in human islets from type 1 diabetes patients and mediates HLA class I overexpression. We presently evaluated the mechanisms involved in IFNα-induced HLA class I expression in human beta cells and determined whether this cytokine contributes to ER stress and apoptosis. IFNα-induced inflammation, ER stress and apoptosis were evaluated by RT-PCR, western blot, immunofluorescence and nuclear dyes, and proteins involved in type I interferon signalling were inhibited by small interfering RNAs. All experiments were performed in human islets or human EndoC-βH1 cells. IFNα upregulates HLA class I, inflammation and ER stress markers in human beta cells via activation of the candidate gene TYK2, and the transcription factors signal transducer and activator of transcription 2 and IFN regulatory factor 9. Furthermore, it acts synergistically with IL-1β to induce beta cell apoptosis. The innate immune effects induced by IFNα may induce and amplify the adaptive immune response against human beta cells, indicating that IFNα has a central role in the early phases of diabetes. Laura Marroqui and Reinaldo S. Dos Santos contributed equally to the study. The online version of this article (doi: 10.1007/s00125-016-4201-3) contains peer-reviewed but unedited supplementary material, which is available to authorised users. Three hallmarks of the pancreatic islets in early human type 1 diabetes and in mouse models of the disease are overexpression of HLA class I [1, 2], presence of markers of endoplasmic reticulum (ER) stress [3, 4, 5] and beta cell apoptosis . The mediator(s) of these phenomena, however, remain(s) to be defined. The cytokine IFNα, a member of the type I IFN family, is expressed in human islets from patients with type 1 diabetes [7, 8, 9, 10] and in the pancreas of NOD mice [11, 12, 13]. Children genetically at risk for type 1 diabetes present a type I IFN-inducible transcriptional signature that precedes the development of autoantibodies [14, 15], and IFNα plays a major role as mediator of HLA class overexpression in human islet cells, a key event in early type 1 diabetes [16, 17]. Laser-captured islets obtained from living donors with recent onset type 1 diabetes showed a significant increase in nearly 50% of the IFN-stimulated genes (ISGs) evaluated . 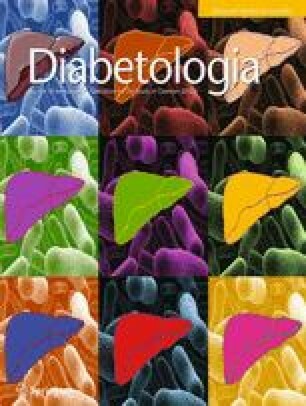 Neutralisation of the IFNα/β receptor (IFNAR1) with monoclonal antibodies prevents diabetes in NOD mice [13, 19] and self-reactive antibodies targeting type I IFNs—particularly IFNα—are associated with protection against type 1 diabetes in patients with mutations in the thymus transcription factor autoimmune regulator (AIRE) . It is surprising that very few studies have investigated the direct effects of this cytokine in pancreatic beta cells [21, 22, 23]. We presently tested the hypothesis that IFNα is a common mediator of HLA class I overexpression, ER stress and beta cell apoptosis in early type 1 diabetes, and evaluated the signal transduction mediating these effects. All experiments were performed in human pancreatic islets and the human insulin-producing cell line EndoC-βH1 , increasing their translational potential [25, 26, 27, 28]. The data obtained indicate that IFNα is a crucial mediator of excessive inflammation and ER stress in the early steps of type 1 diabetes. The human beta cell line EndoC-βH1 (kindly provided by R. Scharfmann, Centre de Recherche de l’Institut du Cerveau et de la Moelle Épinière, Paris, France) was cultured in Matrigel-fibronectin-coated plates . MycoAlert Mycoplasma Detection kit (Lonza, Basel, Switzerland) was used to test for mycoplasma infection. EndoC-βH1 cells have been shown to be free of mycoplasma infection. Human islets from 12 non-diabetic organ donors (ESM Table 1) were isolated with the agreement of the local Ethical Committee in Pisa, Italy and sent to Brussels for experiments (see ESM Methods). Human islets or EndoC-βH1 cells were exposed to cytokines or other agents as described in ESM Methods [23, 26]. Conditions for small interfering RNA (siRNA) transfection using Lipofectamine RNAiMAX lipid reagent (Invitrogen, Carlsbad, CA, USA) and optimal siRNA concentration (30 nmol/l) were established previously . Allstars Negative Control siRNA (Qiagen, Venlo, the Netherlands) was used as a negative control (siCTRL); see ESM Methods for further details. siRNAs against TYK2, STAT1, STAT2, IRF9, USP18, PTPN2, and CHOP were used in this study (a list with further information is provided in ESM Table 2). Cell viability was determined after staining with the DNA-binding dyes Hoechst 33342 (HO) and propidium iodide (PI) as described [29, 30]. See ESM Methods. Poly(A)+ mRNA extraction was performed using Dynabeads mRNA DIRECT kit (Invitrogen) in accordance with the manufacturer’s instructions; reverse transcription was carried out as described . Quantitative real-time PCR was performed using SYBR Green and the data were compared with a standard curve . Expression values were corrected by the housekeeping gene β-actin, as its expression is not modified under the conditions used in this study  (data not shown). A list with the primers used in this study is provided in ESM Table 3. Western blotting was performed as described . Briefly, cells were washed with cold PBS and lysed in Laemmli or RIPA buffer. Immunoblot analysis was performed with antibodies against signal transducer and activator of transcription (STAT) 1–3 and their phosphorylated forms, MHC class I, interferon regulatory factor 9 (IRF9), activating transcription factor 3 (ATF3), X-box binding protein 1 (XBP1), phosphorylated eukaryotic initiation factor 2 (p-eIF2α), binding immunoglobulin protein (BIP), insulin (all at 1:1000 dilution) and α-tubulin (1:5000; see ESM Table 4). Peroxidase-conjugated antibodies (1:5000) were used as secondary antibodies. SuperSignal West Femto chemiluminescent substrate (Thermo Scientific, Rockford, IL, USA) and ChemiDoc XRS+ (Bio-Rad Laboratories, Temse, Belgium) were used to detect bands and Image Lab software (version 3.0, Bio-Rad Laboratories, Temse, Belgium) was used for densitometry analysis. Immunofluorescence was performed as described . Briefly, cells were plated on polylysine-coated coverslips, treated with intracellular IFNα for 24 h and fixed with 4% paraformaldehyde. Cells were permeabilised and incubated with rabbit anti-MHC class I (W6/32) (1:1000) or mouse monoclonal anti-insulin (1:1000). Alexa Fluor-conjugated secondary antibodies were used (see ESM Table 4). After nuclear staining with HO, coverslips were mounted with fluorescent mounting medium (Dako, Carpintera, CA, USA) and immunofluorescence was visualised on a Zeiss microscope equipped with a camera (Zeiss-Vision, Munich, Germany). Images were acquired at ×20 or ×40 magnification and analysed using AxiVision software (version 4.7.2; Zeiss-Vision, Munich, Germany). Images (magnification ×20) were quantified using FIJI software (version 2.0; https://fiji.sc) and calculated as (mean of fluorescence / number of cells) × 100. The same protocol used for immunofluorescence, but without permeabilisation, was used for flow cytometry. Cells were detached by a mild Accutase (Sigma-Aldrich, Schnelldorf, Germany) treatment and then suspended in 2% paraformaldehyde and EDTA-containing PBS and analysed by flow cytometry (FacsCanto; BD Biosciences, San Jose, CA, USA). Analysis was performed using FACSDiva software version 1.0 (BD Biosciences, San Jose, CA, USA). The cellular populations were selected based on size and cell granularity and were analysed for BV421 fluorescence. Antibodies have been previously validated by our group. Data are shown as means ± SEM or presented as box plots indicating lower quartile, median and higher quartile, with whiskers representing the range of the remaining data points. Comparisons were performed by two-tailed paired t test or by ANOVA followed by paired t test with Bonferroni correction, as indicated. Results with p < 0.05 were considered significant. IFNα activated STAT1, STAT2 and STAT3; the maximum effect was observed at 1–2 h post treatment and returned to baseline by 24 h (Fig. 1a). At later time points (8 and 24 h), IFNα induced the expression of IRF9, an essential protein for IFNα signal transduction  (Fig. 1a), and of MHC class I expression at mRNA and protein levels in EndoC-βH1 cells and dispersed human islets (Fig. 1b–d, g). IFNα also increased, at 4–8 h, expression of mRNAs encoding for the chemokine C-X-C motif chemokine ligand 10 (CXCL10) and the antiviral protein MX dynamin like GTPase 1 (MX1) (Fig. 1e, f). IFNα and IFNγ similarly induced MHC class I expression (around 15-fold increase above basal), while IL-1β showed no effect (ESM Fig. 1b, c) and polyinosinic-polycytidylic acid (PIC) only a twofold-increased effect. Expression of MHC class I was not associated with apoptosis in EndoC-βH1 cells (ESM Fig. 1a). Flow cytometry analysis showed that IFNα induced a dose-dependent (starting at 2 U/ml) increase in MHC class I surface expression (ESM Fig. 2a–c) and HLA-ABC and CXCL10 (ESM Fig. 2d, e) mRNA expression. Exposure of EndoC-βH1 cells to IFNα for 24 h upregulated expression of mRNAs and proteins for the following ER stress markers (an outline of the evaluated ER stress markers is depicted in Fig. 2a): DNA damage inducible transcript 3 (encoded by CHOP, also known as DDIT3) (Fig. 2b), ATF3 (Fig. 2c, f, h), heat shock protein family A (Hsp70) member 5 (encoded by BIP, also known as HSPA5) (Fig. 2d, f, i), spliced isoform of XBP1 (XBP1s, encoded by XBP1s; Fig. 2e, f, j) and phosphorylated eIF2α (Fig. 2f, g). Expression of CHOP was also induced in EndoC-βH1 cells by 20–200 U/ml of IFNα (ESM Fig. 3). There was an early (1 h) and transitory increase in phosphorylated EIF2α and its downstream protein ATF3 (Fig. 2f–h). In contrast, XBP1s and BIP protein expression was augmented after 4 h and remained increased until 24 h (Fig. 2f, i, j). TYK2, a candidate gene for type 1 diabetes, contributes to the activation of the type I IFN pathway and regulation of MHC class I expression in human beta cells . Tyrosine kinase 2 (TYK2) knockdown prevented IFNα-induced MHC class I protein expression in EndoC-βH1 cells (ESM Fig. 4a, c) and dispersed human islets (ESM Fig. 4b, d) and also partially or completely prevented induction of CXCL10 (Fig. 3a, g), MX1 (Fig. 3b, h) and the ER stress markers CHOP (Fig. 3c, i), ATF3 (Fig. 3d, j) BIP (Fig. 3e, k) and XBP1s (Fig. 3f, l) by IFNα. Type I IFN binding to its receptor activates TYK2, which in turn phosphorylates STAT1 and STAT2 . Surprisingly, STAT1 knockdown (≥70% at mRNA and protein levels; Fig. 4a, l and ESM Fig. 5a, b) failed to decrease IFNα-induced MHC class I expression at mRNA or protein levels in EndoC-βH1 cells (Fig. 4c–e). This was paralleled by increased expression of CXCL10 (Fig. 4f), MX1 (Fig. 4g) and ER stress markers (Fig. 4h–k), especially CHOP and ATF3. STAT1 knockdown, however, prevented IFNγ-induced HLA class I and CXCL10 expression (ESM Fig. 5d, e), indicating that the level of STAT1 inhibition reached was sufficient to block its downstream effects. Knockdown of STAT2 and double knockdown of STAT1 and 2 (≥60% and ≥70%, respectively; Fig. 4a, b, l), almost completely prevented IFNα-induced expression of MHC class I (Fig. 4c–e), CXCL10 (Fig. 4f) and MX1 (Fig. 4g), and ER stress markers (Fig. 4h–k). STAT2 knockdown led to STAT1 overactivation, and vice versa, suggesting a compensatory effect between them (Fig. 4l). This may explain the observed increment in CXCL10 and MX1 mRNA expression after STAT1 knockdown. These results were confirmed in dispersed human islets (Fig. 5), where only STAT2 knockdown (≥80% at mRNA and ≥50% at protein level; Fig. 5b, i) decreased IFNα-induced inflammatory and ER stress markers (Fig. 5f–h), whereas STAT1 knockdown (≥80% at mRNA and protein levels; Fig. 5a, i) increased expression of CXCL10 (Fig. 5d) and MX1 (Fig. 5e) mRNA. STAT2 dimerises with IRF9 in the absence of STAT1; this dimer subsequently binds to the IFN-stimulated response element (ISRE) and mediates downstream signal transduction . Knockdown of IRF9 (≥60% at mRNA and ≥80% at protein level; Fig. 6b, ESM Fig. 6) and double knockdown of STAT2 and IRF9 (Fig. 6a, b and ESM Fig. 6) decreased IFNα-induced HLA-ABC, CXCL10 and MX1 (Fig. 6c–e) and ER stress markers (Fig. 6f–i) mRNA levels to the same extent as STAT2 knockdown alone, indicating that both are part of the same signalling pathway. No change in apoptotic rate was observed after knockdown of STAT1, STAT2 or IRF9 (or combinations of them) in EndoC-βH1 cells, or after knockdown of STAT1 or STAT2 in dispersed human islets treated (or not) with IFNα (data not shown). Inhibition of ubiquitin-specific peptidase 18 (USP18) induces beta cell inflammation and apoptosis upon IFNα treatment by exacerbating IFN-induced phosphorylation of STATs . To determine whether this would also augment IFN-induced ER stress, we knocked down USP18 in EndoC-βH1 cells. USP18-silenced cells (≥50% at mRNA level; Fig. 7a) treated with IFNα had increased levels of p-STAT2 and p-STAT1 (five- and twofold, respectively) (Fig. 7b–d), higher prevalence of apoptosis (Fig. 7e) and increased mRNA expression of HLA-ABC (threefold, Fig. 7f), CXCL10 (50-fold, Fig. 7g) and MX1 (threefold, Fig. 7h) and at least threefold higher ER stress markers (Fig. 7i–l), compared with control cells. On the other hand, PTPN2 (a candidate gene for type 1 diabetes), which encodes protein tyrosine phosphatase, non-receptor type 2, a protein phosphatase that dephosphorylates members of the Janus kinase (JAK)/STAT family but not TYK2 or STAT2 , did not affect IFNα-induced HLA-ABC, inflammation and ER stress marker mRNA expression in EndoC-βH1 cells (ESM Fig. 7). Mild ER stress increases the expression of inflammatory mediators and sensitises rat beta cells to IL-1β-induced apoptosis . As previously observed (ESM Fig. 1), neither IFNα nor IL-1β alone induced apoptosis. The combination of both cytokines, however, increased cell death in a dose-dependent manner (Fig. 8a). IFNα alone, but not IL-1β, induced the expression of HLA-ABC, MX1 and CXCL10 mRNA, even at low concentrations (200 U/ml) (Fig. 8b–d). The two cytokines only acted synergistically in the case of CXCL10 (Fig. 8c). The combination of cytokines, mainly at their highest concentrations, led to a significant increase in ER stress markers when compared with IFNα or IL-1β alone (Fig. 8e–h). Similarly to the observations made in EndoC-βH1 cells, treatment with IFNα or IL-1β separately did not induce apoptosis in dispersed human islets, while treatment with IFNα plus IL-1β doubled beta cell death after treatment for 24 h (Fig. 8i). Silencing of CHOP or pre-treatment with the chemical chaperone tauroursodeoxycholic acid (TUDCA) partially prevented apoptosis induced by a combination of IFNα and IL-1β in EndoC-βH1 cells, suggesting that IFNα + IL-1β-induced apoptosis is at least in part mediated by ER stress (ESM Fig. 8). Type 1 diabetes is a multifactorial autoimmune disease in which an individual’s genetic background interacts with environmental cues, leading to islet inflammation (insulitis), amplification of this early innate immune response and, in some cases, transition to a long-term adaptive autoimmune attack against the beta cells . The nature of the first components of the innate immune response and their contribution towards the transition to a full autoimmune response remains to be determined [6, 36]. Type I IFNs may be key links between environmental and genetic risk factors in type 1 diabetes and the triggering/amplification of insulitis . Thus, pathway analysis of type 1 diabetes candidate genes expressed in human pancreatic islets identified ‘interferon signalling’, ‘role of JAK1, JAK2 and TYK2 in IFN signalling’ and ‘role of pattern recognition receptors in recognition of bacteria and virus’ as the three top canonical pathways . TYK2, a candidate gene for type 1 diabetes, regulates both PIC- (a mimic of double-stranded RNA produced during viral infection) and IFNα-induced MHC class I expression and inflammation in human beta cells . Furthermore, histological analysis and other approaches have identified higher expression of type I IFNs in islets from patients with type 1 diabetes [7, 8, 9, 10], and self-reactive antibodies targeting type I IFNs are associated with protection against type 1 diabetes in patients with an autoimmune syndrome . Three hallmarks of the pancreatic islets in early human type 1 diabetes are overexpression of HLA class I [1, 2], ER stress [3, 37] and beta cell apoptosis , and we presently show that IFNα induces or contributes to these three phenomena in human beta cells. Combinations of the pro-inflammatory cytokines IL-1β, TNFα and IFNγ, which probably appear later in the progression of islet inflammation as compared with IFNα, induce ER stress in beta cells. ER stress might contribute to the magnification of apoptotic pathways, exacerbation of inflammation and increased antigen presentation in the context of type 1 diabetes [26, 37, 38]. Here, we report for the first time that IFNα alone upregulates expression of several ER stress markers, including p-EIF2α, XBP1s, BIP, C/EBP homologous protein (CHOP) and ATF3. Although not sufficient by itself to induce beta cell death, ER stress contributes to human beta cell death when these cells are exposed to IFNα plus IL-1β, as demonstrated by the partial protection afforded by knockdown of the pro-apoptotic transcription factor CHOP or co-culture of the cells with the chemical chaperone TUDCA (present data). Importantly, TUDCA administration was found to provide protection against diabetes in two mouse models of the disease . Data from other tissues have already indicated a possible crosstalk between type I IFNs and ER stress: ER stress enhances IFNβ induction in PIC-treated macrophages  and potentiates PIC-induced expression of IFNβ and other inflammatory cytokines in dendritic cells . Furthermore, PIC-induced overexpression of ISGs triggers ER stress in HeLa cells . To better understand the mechanisms underlying IFNα-mediated signalling in human beta cells, we silenced the different proteins involved in the type I IFN pathway (Fig. 8j), including TYK2, STATs, and IRF9. Inhibition of TYK2, a key link between the type I IFN receptor and its downstream signalling, decreased IFNα-induced expression of ER stress marker genes, mainly CHOP and ATF3, and prevented CXCL10 and MX1 expression. Inhibition of the transcription factors STAT2 and IRF9 prevented IFNα-induced expression of HLA class I, and inflammation and ER stress markers, suggesting that these two proteins are critical for the activity of IFNα in beta cells. Unexpectedly, STAT1 inhibition not only failed to decrease the expression of these markers but also actually increased the expression of CXCL10, MX1 and ATF3. STAT1-silenced cells presented higher p-STAT2 expression, suggesting a compensatory activation of STAT2 once STAT1 is blocked, apparently increasing markers of inflammation and ER stress. The same was the case when STAT2 was blocked: there was an increase in STAT1 activation but in this case upregulation of STAT1 did not prevent inhibition of the downstream effects of IFNα (Figs 3 and 4). Primary murine macrophages deficient in STAT1, when exposed to Legionella pneumophila in the presence of type I IFNs, induce a complex between STAT2 and IRF9 that triggers a potent but delayed IFN response against the bacteria . This indicates that both STATs are functionally redundant in macrophages . Our present data, however, suggest that the roles of STAT1 and STAT2 are not redundant in beta cells, as the observed increase in STAT1 activation is not sufficient to compensate for the lack of STAT2. A very recent study has shown that HLA hyperexpression is strongly correlated with STAT1 expression in beta cell-containing islets from type 1 diabetes patients . STAT2 was not investigated in this study. The present data suggest that STAT1 is important for IFNγ-induced HLA class I upregulation, but not for IFNα, which acts mainly via STAT2. Collectively, these observations suggest that HLA overexpression in the islets of patients developing type 1 diabetes may be regulated by different mechanisms at different stages of the disease. In the early stage, IFNα-induced HLA upregulation may require mostly the TYK2–STAT2–IRF9 axis, while at a later stage there may be a second wave of induction promoted by immune-cell-produced IFNγ via STAT1 and downstream mediators. Taken together, the above observations indicate that the following steps are crucial for IFNα signalling in beta cells (Fig. 8j). Upon exposure to ‘danger signals’ (e.g. viral infection or other exogenous or endogenous mediators that remain to be determined; [10, 36, 42, 43]), production and release of type I IFNs (IFNα/β) is triggered in beta cells and neighbour cells, exerting both autocrine and paracrine effects. IFNα binds to the IFNAR1 and activates the type I IFN pathway, in which the TYK2–STAT2–IRF9 axis plays a critical role. This activation induces a massive expression of ISGs, hyperexpression of MHC class I proteins and an increase in the chemokine CXCL10. Conjunction of these factors with a genetic predisposition to type 1 diabetes (for instance, increased expression of TYK2) places the beta cells in a delicate situation: on one hand, the increase in CXCL10 expression attracts monocytes, T lymphocytes and natural killer cells , and on the other, upregulation of MHC class I and the putative induction of modified autoantigens by ER stress increases the efficiency of presentation of beta cell antigens to the immune cells . All these effects may be secondary to local release of IFNα. Importantly, IFNα also sensitises beta cells to IL-1β released by activated macrophages during early insulitis, increasing beta cell death and consequent antigen presentation. This places IFNα as a central modulator of excessive inflammatory and ER stress responses in the early stages of type 1 diabetes, contributing to the progressive destruction of pancreatic beta cells and to the triggering of autoimmunity in genetically predisposed individuals. Thus, targeting IFNα in type 1 diabetes may be a promising adjuvant therapy in the very early stages of the disease. The authors are grateful to M. Pangerl, A. M. Musuaya, N. Pachera and I. Millard of the ULB Center for diabetes research, Université Libre de Bruxelles, Belgium, for excellent technical support. The data that support the findings of this study are available from the corresponding authors (lmarroqu@ulb.ac.be and deizirik@ulb.ac.be) upon reasonable request. This work was supported by grants from the Fonds National de la Recherche Scientifique (FNRS), Belgium, the Horizon 2020 Program (T2Dsystems [GA667191]) and the NIH-NIDDK-HIRN Consortium 1UC4DK104166-01, USA to DLE. DLE and PM have received funding from the Innovative Medicines Initiative 2 Joint Undertaking under grant agreement No 115797 (INNODIA). This Joint Undertaking receives support from the Union’s Horizon 2020 research and innovation programme and ‘EFPIA’, ‘JDRF’ and ‘The Leona M. and Harry B. Helmsley Charitable Trust’. LM is supported by an FNRS post-doctoral fellowship. LM and RSDS contributed to the original idea and the design of the experiments, researched data, contributed to the discussion and wrote, revised and edited the manuscript. AOdb, ACdB, LM and PM researched data and revised and edited the manuscript. DLE contributed to the original idea and the design and interpretation of the experiments, contributed to discussion and wrote, revised and edited the manuscript. All authors read and approved the manuscript, and gave informed consent for publication. LM and DLE are the guarantors of this work and, as such, had full access to all the data in the study and take responsibility for the integrity of the data and the accuracy of the data analysis.